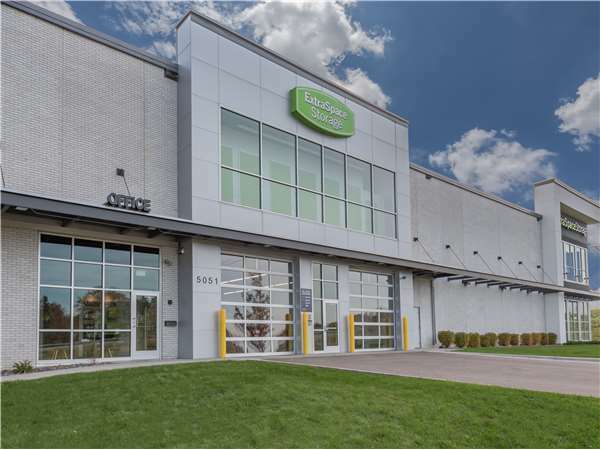 Located on MN-7 between MN-100 and Beltline Blvd, Extra Space Storage serves Minneapolis residents near St. Louis Park, Southwest Minneapolis, Hopkins, Uptown, and more. Locals will recognize our facility next to Nordic Ware. Extra Space Storage on MN-7 is the convenient storage solution you need in Minneapolis near St. Louis Park! We offer a wide range of storage units, climate-controlled storage, vehicle storage, and exceptional security. You can store items of all sizes with ease at our Minneapolis storage facility! We have units from 3x4 to 17x25 with features like first-floor access, elevator access, and drive-up access! With security measures like security access to your floor only, 24-hour video surveillance, and electronic gate access, you can store your items with peace of mind at Extra Space Storage. Protect temperature-sensitive items from extreme heat and cold with a climate-controlled unit or a heated storage unit. Units with climate control stay between 55 and 80 degrees year-round. These units come in sizes 3x4 to 17x25, and some include drive-up access as well. Units with heating maintain a warm environment at all times to ensure your unit doesn't get too cold. These units come in sizes 16x20. Do not rent from this St Louis Park Hwy 7 location! They raise the rates even after a SUMMER of electrical and FLOODING problems that a) were never communicated to residents UNTIL we ended up contacting national emergency line b) took MONTHS to fully repair and c) kept us LOCKED OUT OF OUR OWN BUILDING when we needed it most! What a joke! They gave NO CREDITS to any of the accounts for these ongoing MASSIVE inconveniences and now have the AUDACITY to raise our rent by 15% after 1 year of renting there!!!!!!!!! AFTER ALL THESE CLOSURES AND FIRES AND FLOODS AND BROKEN DOORS AND ELECTRICAL OUTAGES WENT ON FOR WEEKS AND WEEKS AND WEEKS THIS SUMMER!! This is a joke of a storage unit! DO NOT rent to them! They took part of an OLD decaying building and added on and that's why they are having so many problems at this site! The facility is clean, safe and in a convenient location. Chuck was very helpful and great to work with. Very impressive customer service and facility. One of the best decisions I've made in s long time. Beautiful, brand new facility. Nice carts to haul your things, clean restrooms, and even a water fountain. Chuck was extremely helpful in getting me checked in. I'm a very happy customer. I was very pleased with the overall service that Chuck provided. He was very straight forward with the rates, diligent at making sure I knew where my unit was, and overall very friendly. I didn't think twice about the safety of my belongs. The storage facility was very clean and can tell that Chuck takes a lot of pride in his job! I initially rented a storage locker that my 16 2' sea kayak would fit into. The space was great, but it was not a straight shot down a hallway to get to the locker, which meant I had to have another person help me raise one end of the kayak up high while I kept the other end down and maneuvered it around a corner. It worked, but it was not ideal. I mentioned this to Chuck, who started troubleshooting what options we had- finally he came up with the idea of using the garage spaces below. There were a couple of areas that could not have a large vehicle placed in them due to size and obstructions. He started working to get these areas converted into rentable areas. He put a lot of effort into it, and kept me updated as he sussed things out. In the end, I was able to rent a garage space for by boat, which will make it much easier to ***** and off of my car. Plus I have 24 hour access for all those late-night paddles! I am extremely pleased with the assistance I was given by Chuck and would highly recommend Extra Space Storage to anyone! We actually moved from one Self Storage unit to "Extra Storage" We found the convenience of being just off of a major highway, the overall cleanliness of the facility and especially, the helpfulness of the staff made the true difference. Drive South on MN-100 S. Merge onto MN-100 S/Beltline Hwy S. Then take the MN-7 exit then keep left at the fork in the ramp. Turn left onto Highway 7/MN-7. When you get to the stop light take a right on Beltline, then take your first right. This will be the HWY-7 Service road. Drive down HWY-7, you will see us on the left side of the road. Drive North on MN-100 N to County Hwy-25/MN-7 exit. Turn right onto MN-7/County Hwy-25/Highway 7. When you get to the stop light turn right onto Beltline Hwy then take your first right. This is the HWY 7 service road. We will be on the left side of the road. Turn onto MN-7 E,Take the Wooddale Avenue exit,Turn right onto Wooddale Ave S,Turn left onto W 36th St,Turn right to merge onto MN-100N,Take the MN-7/County Road 25 exit. Turn on Ottawa Ave S. Take first right onto Highway 7 Service Drive. We are next to the Nordic Ware Factory Store.